Inner beauty is often over-rated. As I mentioned the other day, I spent the afternoon playing dress-up with my cosmetics. Curious about who is checking out my blogs, I noticed a few searches for 1920's make-up that, somehow, brought them to my blog. Now, I have tried to achieve the perfect 1920's vampish look but have always failed. Perhaps, I am not so talented. Perhaps, my face isn't appropriate for silent movies and flapper dresses. Sigh. I swear...I will perfect this vintage look...and I will win! 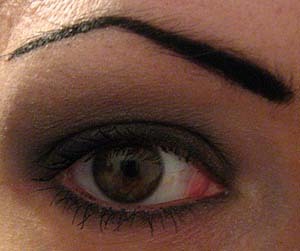 Warning : This is NOT a "how-to" or a demonstration of vintage makeup. 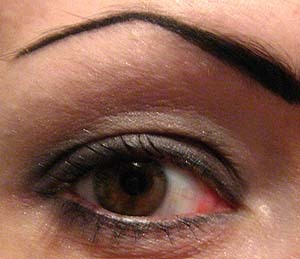 This is me, TRYING to do this look and, unfortunately, not succeeding. 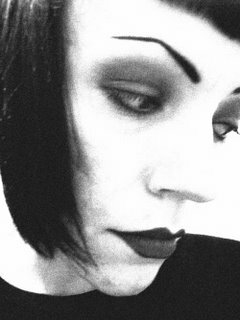 Saying that, I do think I could fit in nicely at a smoky goth club. 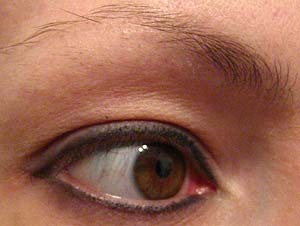 I started out with a naked eye, which I lined with a black eyeliner pencil. 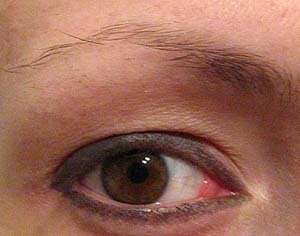 As you can see, this clearly wasn't a good quality eyeliner as it looks smoky gray. Man, I forgot how much I LOATHED using pencil eyeliners. You can tell by my application technique. I hate it. Then, I smudged the eyeliner. I should have used a Q-Tip but there was none to be found. I improvised and used a small sponged-tip makeup application. And yes, I loathe those too...but not enough to write that word in capital letters. The eyeliner didn't smudge that well, so I'm assuming that my poor quality pencil eyeliner is at fault. 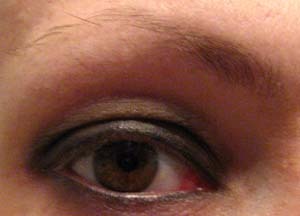 Unimpressed as I was, I took out my trusted MAC angled brush and Carbon shadow and lined my eye again. It turned out much more crisp and even. Using a powder shadow and angled brush has so many more benefits than eyeliner pencil, in my opinion. It's softer and delicate, yet can be played up to look dramatic. And, it is much more easier to smudge - which I did afterwards with a smaller and rounded firm brush. With my fluffy eyeshadow brush in hand, I blended a white shimmery powder(which isn't era correct) into the gray to smooth out the edges. Yep, it's starting to look like another smoky eye. And now, apply some mascara! It looks much more completed. 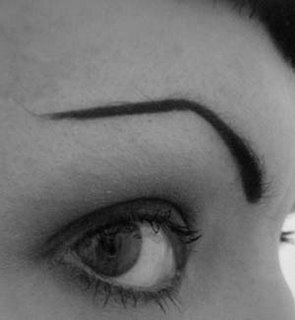 Unfortunately, I just couldn't do the 1920's eyebrow. My father-in-law was coming over and I did not want to frighten him. Something still felt missing. I took out my fluffy eyeshadow brush again and used a little more Print shadow to sweep up towards my eyebrow. Then...a little more mascara for my puny eyelashes. Looks kinda cool in black and white, huh? Still, not as dramatic as I would have liked it to look. Ah well. I would have taken some photos of the "bee-stung", Clara Bow lips...but man, it did not turn out. My lips just aren't ment to be from the 1920's. I ended up filling the entire lips in, but exaggerated the middle of the top and bottom lips. It looked really ridiculous in color so I did it in black and white and then Photoshopped it. Ah, the magic of Photoshop. I played around with the brightness and contrast a bit so I could get more a dramatic eye - if only doing 20's makeup was this easy! Hey, at least I'm having fun...right?! Your 1920s make up wasnt all that bad for a first try! I'm a make up artist. and studied period make up. 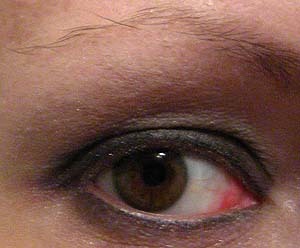 the way to do a 1920s eye is to have the focus towards the inner eye rather that the outter. To give the eye a slanting down look. that was the 20s look. eye brows look good. very dark but thats ok! the lips are hard!!! very hard to get right. even though your pictures are black and white it looks as though you have used a dark lip colour. a plum mixed with a deep red always looks fantastic. dont extend the lip out to much and always keep it small. with a nice defined cubids bow, which you have done really well. remember to line your lips with a nice red lip liner. it helps get the shape right before you apply the lipstick! The Smoky Eye ... Made Easy! Liquid Eyeliner ... Made Easy!